Welcome our New Full Time Support Guy! TH3D is happy to announce that William “Mac” McMillen is joining us full time starting 8/21/2018 and will be allowing Tim to focus on product development. Mac has been with us in a part time capacity for a little while now and he was referred to us by a customer that he helped out. He’s very well versed in our products and 3D printing in general. He’s been doing the development for adding the Geeetech A10 printer to our popular Unified Firmware that you all love and that machine will be supported in the next few days thanks to his work! 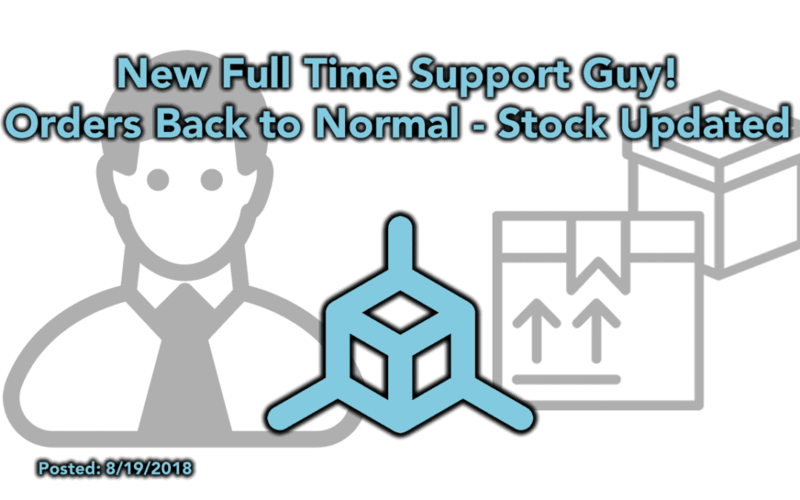 William will be covering most of our day time hours and will be on our support tickets in the evenings on some days as well as weekends so you can get better support coverage. Once we figure out the exact hours outside of the ones we have on the site we will update those to reflect the new support coverage. If you see Mac on the support tickets and/or communities give him a warm TH3D welcome! Having him on our time is going to be instrumental to getting our customers quicker support on tickets and our communities and allow Tim to focus on product development. Tim and Tor will still be on support but will be our higher escalation points in the event of more complex product issues and/or solutions. We’re completely amazed that we’re at this point and able to create real jobs! We wouldn’t be able to do this without our customers and we greatly thank you! We closed down the shop over this weekend so that we can get caught up on orders. We are happy to announce that ALL orders that were in the queue will be shipped tomorrow morning. We brought in 4 extra people to help us get the orders completed. We apologize for the inconvenience that we caused by closing the store but we were spending too much time answering emails regarding order statuses so we opted to close the shop so that we can get orders back to normal. We have everything stocked up in terms of our products so that we can go back to our normal next day shipping times. We re-stocked a bunch of products in the shop as inventory also came in over the last few days. We’ll be re-stocking the Tough V6 Hotends once we take some new pictures of the new hotends we got in. We’re now going to be shipping the Tough V6 Hotends that will include 4 nozzles (2 brass, 2 steel) AND 24V heater +24V fan so that no matter what machine you have it will work with it. This means that the Tough V6 Hotend will work with machines like the Ender 3, Tornado, and the Geeetech A10 that use 24V systems. This is NOT raising the price and we will be still selling them at the $29.99 price. We also have re-stocked the CR-10S dual board kits and associated bundles as well. Those are $99.99 and include the new board, stepper motor, and cables.